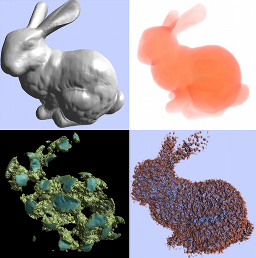 A CUDA/GLSL library for the efficient 3D real-time rendering of highly detailed scenes. For all technical questions about GigaVoxels/GigaSpace, please use the public mailing list gigavoxelsdist-info@lists.gforge.inria.fr (all the messages sent to this list are archived and visible to all). You don't need to subscribe to this list to post a message on it, but doing so would allow you to receive news about the project. For other requests that INRIA might be able to address, please contact gigavoxels-contact@inria.fr. ( Reminder: GigaVoxels is free software under BSD 3 license, for both non-commercial and commercial use ).